The Brunch Pie at Iron Born Pizza in Smallman Galley. Photo by Tom O'Connor. Brunch is the perfect way to kick-start any weekend: a happy indulgence where all your sweet and savory cravings collide, and where morning coffee meets day drinking. It can also be a miracle cure when you realize everything needed to knock back a hangover is right inside that spicy bloody mary or bubbly mimosa. Local chefs are taking notice of brunch lovers and launching chef-driven menus that go beyond usual expectations. If you haven’t made brunch a priority lately, we’ve got fresh options for you along with a rundown of some much-loved places you may not have had a chance to try yet. The spit-roasted turkey biscuit sandwich at Union Standard. Photo by Tom O’Connor. Chef Derek Stevens knew he wanted the spit-roasted turkey biscuit sandwich on the menu when Union Standard started serving brunch last month. 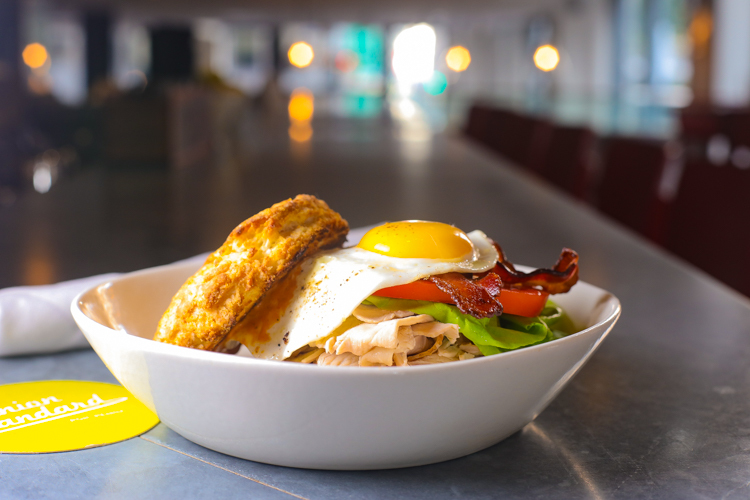 Layers of roasted turkey on a large flaky buttermilk biscuit with bacon, lettuce and tomato and a fresh egg perched at the top. A kick of chili mayo brings all the flavors together. 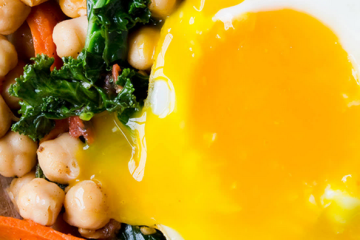 “I love it because it’s a nice combination, a brunchy kind of sandwich,” says Stevens. The Downtown eatery features seasonal and handmade takes on brunch dishes. Cinnamon roll French toast is topped with Millie’s maple oat ice cream and Pennsylvania maple syrup. Omelets with braised bacon and egg scrambles with fresh veggies share the menu with items from Union Standard’s raw bar and wood fire grill. Cocktail highlights include “Maggie’s Morning,” a blend of Maggie’s Farm Rum Coffee Liqueur with Gosling’s rum, a cold brew coffee with cognac, and Union’s take on the bloody mary and mimosa. Brunch: Saturday and Sunday 10 a.m. – 2 p.m. Reservations accepted. Sure, it’s not anything close to traditional brunch, but it’s pizza meets brunch, and you need to know about it. Chef Pete Tolman makes Detroit-style pizza, which is basically pan-style, cooked in cast iron with a crisp crust and light interior. “People call it a pizza cloud,” says Tolman. 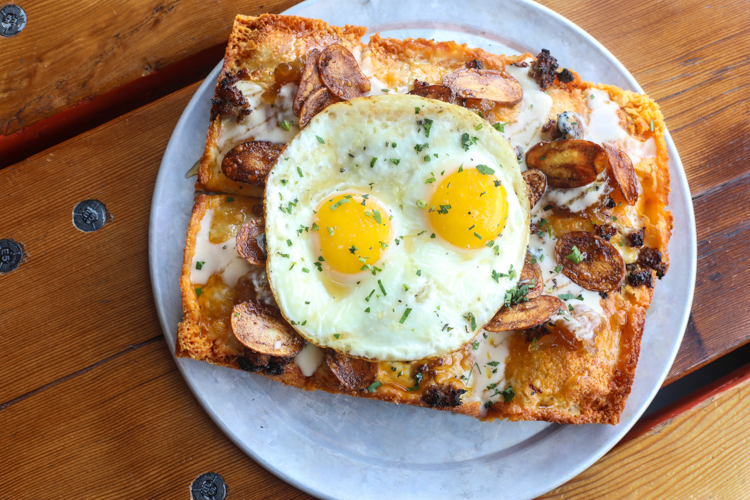 The Brunch Pie grew out of the chef’s desire to turn his love of sausage and gravy on biscuits into a pizza. “We roast sausage right into the crust with cheddar cheese, then we make our own sausage gravy, add caramelized onions, fingerling potatoes and lay two sunny-side-up eggs on top,” says Tolman. The finished product is drizzled with a local Pennsylvania maple syrup from Paul Family Farms for sweet-meets-savory perfection. 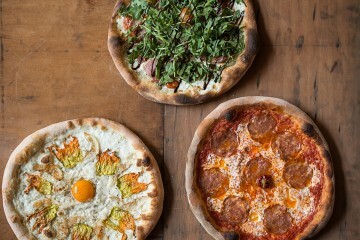 Other pizza offerings on the brunch menu include Detroit Red Top pie with brick cheese and pepperoni, a white pie with whipped ricotta and arugula and a loaded meat pie. All come with an “add an egg” option. Iron Born serves up great non-pizza dishes at brunch as well, including a BLT sandwich, and meatballs with Anson Mills polenta, marinara, lemon oil and gremolata. Yes, you can put an egg on that one too. A carbonara pizza (put an egg on it) is on its way. Need a bloody mary to make it brunch? The Smallman Galley bar is just a few steps behind you. Brunch: Saturday and Sunday 10 a.m. – 3 p.m.
Shakshuka at Or, the Whale. Photo by Tom O’Connor. Brunch was always part of the plan when Chefs Dennis Marron (The Commoner) and Jessica Lewis (Carota Cafe) were creating the menus for Or, the Whale. Brunch is served seven days a week at the newly-opened seafood and chop house, so it’s a cornerstone of their concept. 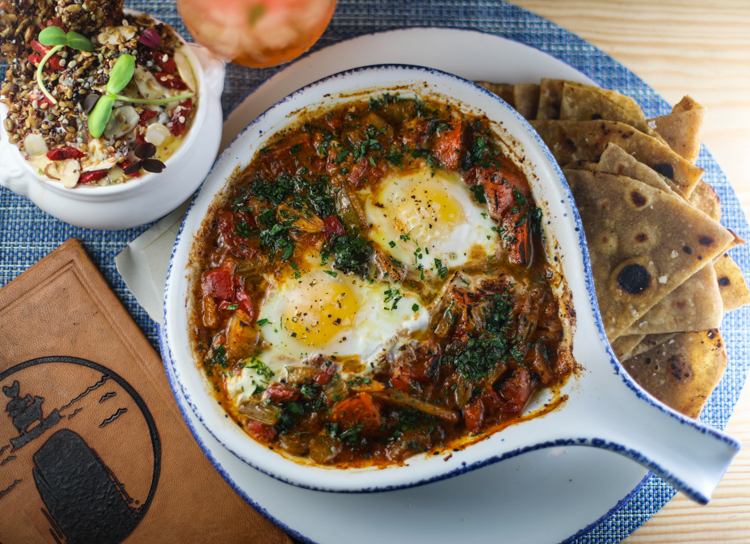 The Tunisian-inspired shakshuka, eggs poached in a ragout of tomatoes, chili peppers, onions and spices, was a top pick for both chefs. 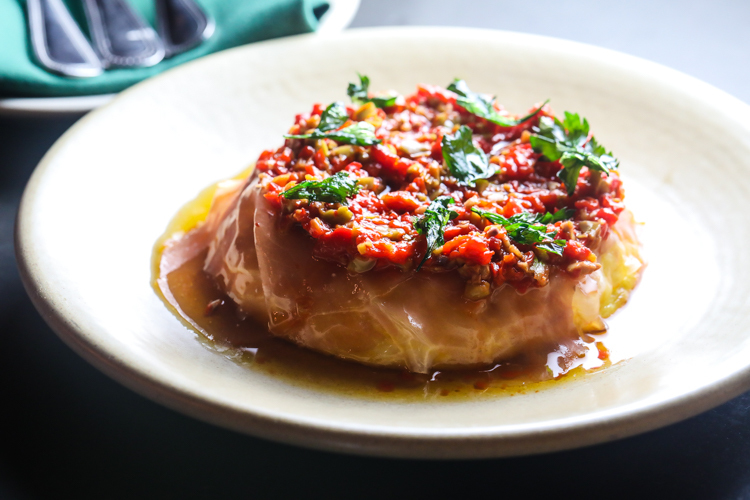 “I loved serving it at Carota Cafe [at the Smallman Galley] and am so happy to serve that dish — so heart-healthy and so flavorful,” says Lewis. Or, the Whale’s new bar program is strong. The brunch cocktail selection is beachy and breezy featuring a housemade gin & tonic, an aperitivo spritz, an apricot-flavored mimosa, a bellini, and strong bloody mary featuring their own hot sauce, just to name a few. Brunch: Daily 8 a.m. – 2 p.m. Reservations accepted. The Tortilla Española at Morcilla. Photo by Tom O’Connor. Morcilla began brunch service featuring Spanish cuisine and tapas over the summer. While brunch may not be a thing in Spain, midday meals are everything there. Not surprisingly, the creative team at Morcilla has come up with a unique take featuring small plates, charcuterie and several egg dishes that fall in line with brunch expectations. So what makes it a Morcilla brunch? “I think our signature dishes are probably the Tortilla Española, the Oxtail Toast and the Benedict with smoked hollandaise and Serrano ham,” says chef-owner Justin Severino. The Tortilla Española is a beautifully crafted dish made with potato and eggs, carefully wrapped in ham and topped with smoked olive and piquillo pepper. It arrives at the table like a work of art and it makes a great centerpiece to surround with other inventive tapas from the menu. According to Severino, the omelet, served with goat cheese and caramelized onions, was an easy pick when putting together the brunch menu, “because I love them,” he says. Brunch cocktails at Morcilla feature inspired combinations of Spanish liqueurs. Knowledgeable bartenders make Morcilla a great place to explore different spirits that may be unfamiliar. Brunch: Sunday 11 a.m. – 2 p.m. Reservations accepted. Have you had a chance to try any of these other brunch options yet? Italian-inspired brunch where you can find prosciutto eggs benedict, lemon and ricotta pancakes, breakfast pizza and zeppole, which are deep-fried sweet dough balls. Brunch: Sunday 10 a.m. – 2:30 p.m. Some of the best cheese options in the city make this an extra special brunch. Casellula serves up delightful flavor combinations like ricotta toast with chocolate and cherry, a cheesy egg plate and a special grilled cheese sandwich made with comté, cheddar, Emmentaler, chévre and tomato. Pork belly and hash browns are served as sides. Brunch: Saturday and Sunday 11 a.m. – 2 p.m. Reservations accepted. Classic brunch with a French bistro flare. Bananas Foster pancakes, prosciutto and gruyére tart and the Bistro burger are all highlights. There’s also a selection of classic brunch cocktails. Brunch: Sunday 11 – 2:30 p.m. Reservations accepted. Always an enticing brunch menu with creative spins on classics. Here you’ll find mouthwatering options like tiramisu French toast, lemon buttermilk pancakes, fried zucchini benedict, baked eggs, fried chicken and the “Marco burger.” Sides of doughnuts and bacon to share with the table are a good idea. Bar Marco always offers a great cocktail menu, and mornings are no exception. Brunch: Saturday and Sunday 10 a.m. – 3 p.m. Reservations accepted. Specializing in Middle-Eastern and vegan cuisine, B52 is known for being a crowd pleaser with vegetarians and carnivores alike. Buckwheat sourdough pancakes and mezze platters are standouts on the brunch menu. There’s also a tofu scramble, potato latke sides and a rotating selection of housemade sodas and kombuchas. Don’t miss the full-service espresso bar with house baked goods. Brunch: Sunday 9 a.m. – 3 p.m. Morning and midday specialties from across the pond (or across the “Mon” if you’re traveling from Downtown). English breakfast, fried eggs and baked beans (Heinz, of course), tomato and bangers and toast are highlights. There’s also boxty, an Irish favorite which is basically a huge crispy potato pancake stuffed with all kinds of deliciousness. Brunch: 9 a.m. – 3 p.m. No reservations, so drink up at the bar while you wait.